A lush green lawn is one of the great pleasures of the natural world, whether it’s right outside your front door or on a majestic fairway at a legendary golf course. But anyone who has tried to grow the perfect lawn the conventional way knows it requires an endless cycle of watering and applying synthetic fertilizers and toxic chemical pesticides that costs a lot of money and kills all the life in the soil, on the surface, and on the grass. Fortunately, there’s a better way. Organic lawn care is not only healthier for the environment, it’s actually cheaper and less water-intensive, whether you’re managing a small yard or acres of turf. 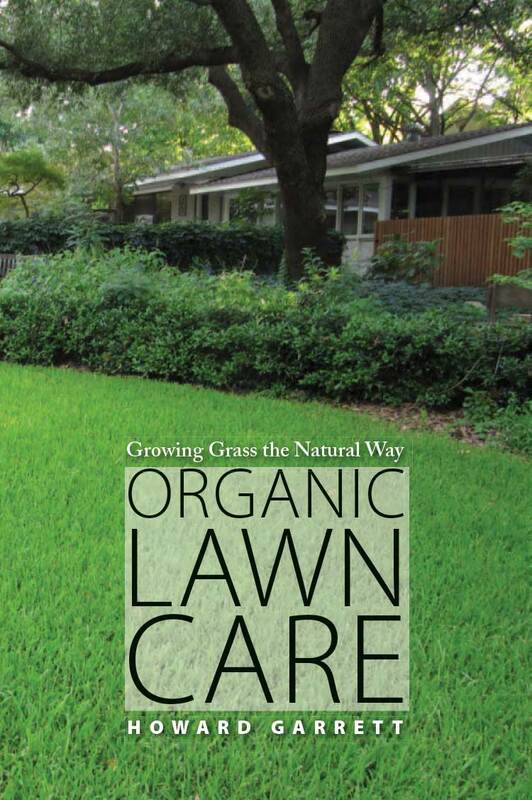 In Organic Lawn Care: Growing Grass the Natural Way, Howard Garrett takes you step-by-step through creating and maintaining turf organically. He begins with the soil, showing you how to establish a healthy habitat for grass. Then he discusses a variety of turfgrasses, including Bermudagrass, bluegrass, buffalograss, fescue, ryegrass, St. Augustine, and zoysia. Howard explains in detail how to establish and maintain a lawn, including planting, mowing, watering, fertilizing, composting, and managing weeds and pests. And he offers alternatives to lawn grasses and turf, describing the situations in which they might be your best choice. you can order it online from Amazon or UT Press.